After years of dropping phones and constantly breaking them. I decided to pickup a cheap IP68 rated rugged Android phone from China rather than paying $300-$500 for a phone locally that offers the exactly same specifications and features for a much higher price. So here is my review of the DIGOOR DG2 Plus. First of all. 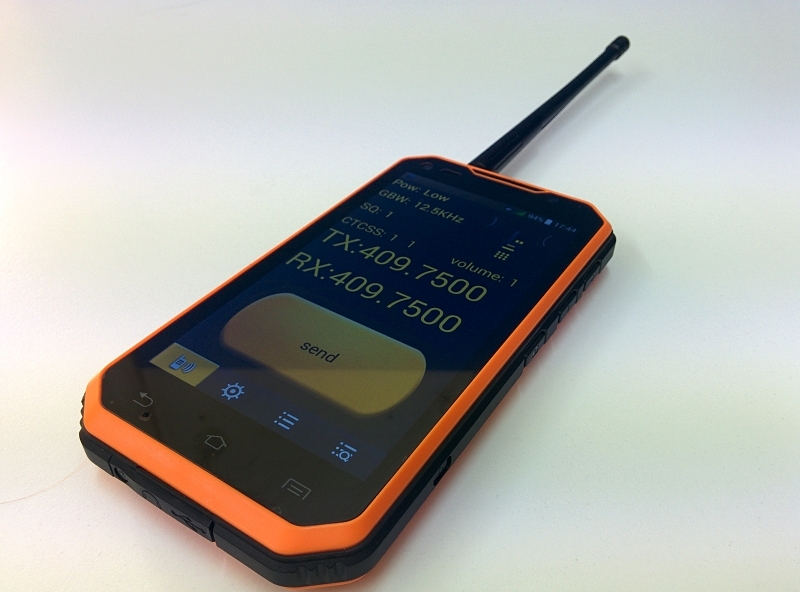 This phone is very big, thick and heavy due to it’s rugged design that meets the IP68 standards. 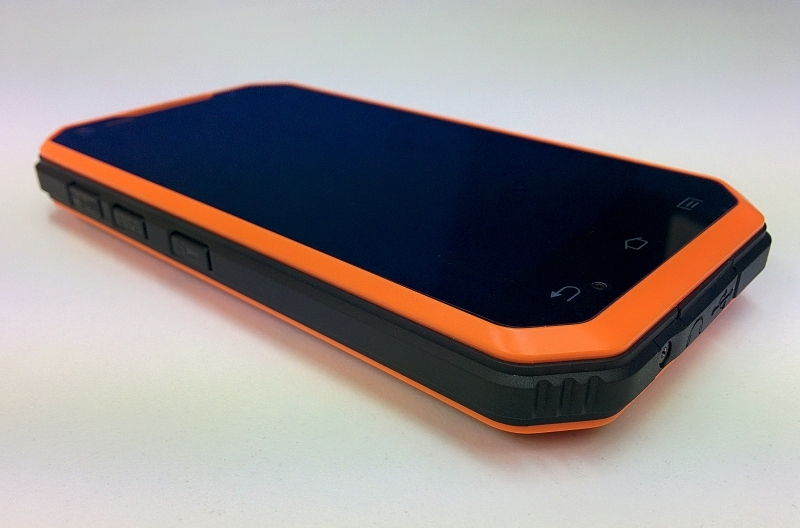 The body consists of orange hardend plastic that provides protection around the screen and the edges of the black rubberised plastic. 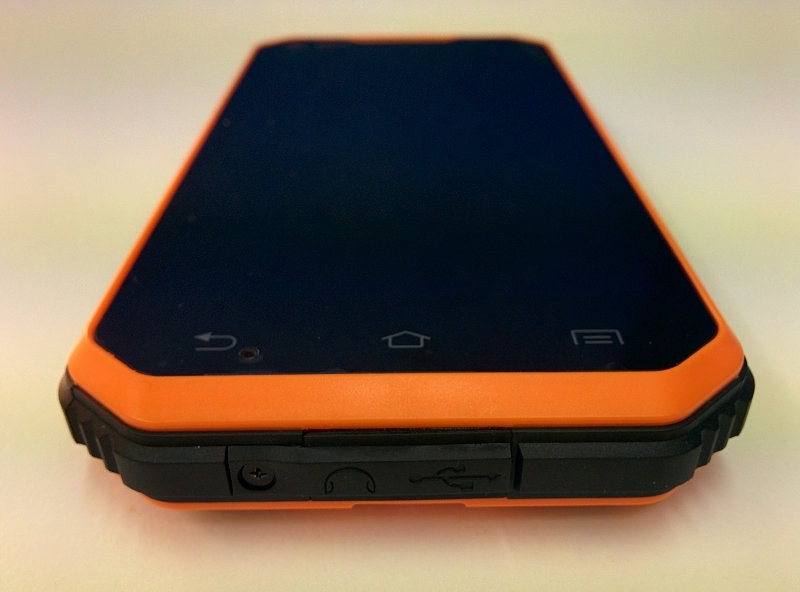 This phone has been designed to withstand hard drops and submersion in water. The phone feels solid and easy to hold with a firm grip. This phone features a lot more buttons than most others. It has the standard power/wake button and volume control, but it also features a speak button for the walkie talkie function, a button to activate the flashlight and a camera button to take pictures that is particulary useful if you’re using this phone underwater in the pool. The final and most interesting button would be the SOS button. Using an app on the phone you’re able to set that button to dial a number when pressed. However, I had to disable it as I kept making accidential emergency calls, but an idea would be to set it as a number you call regularly. The DIGOOR DG2 Plus features a 5.0 inch capactive IPS screen that feels responsive and smooth. 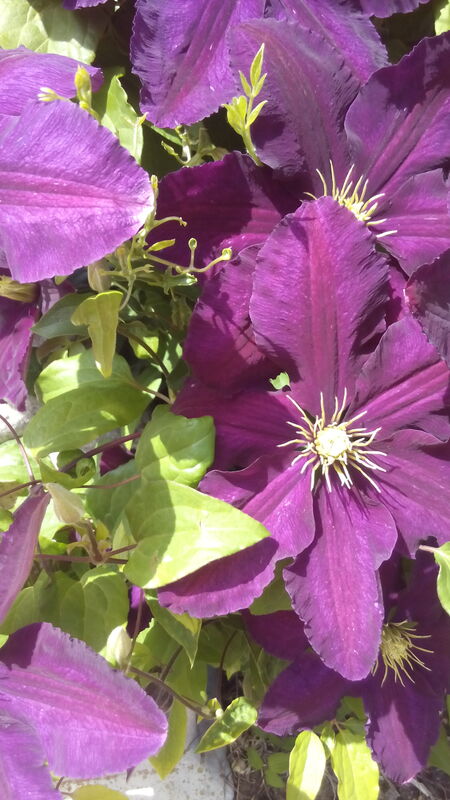 Thanks to the IPS panel the colours are very clear and the screen visible outside in the sunlight. The screen also comes with a screen protector already installed that helps protect the glass screen from any scratches and damage from drops. The screen also has 3 physical buttons rather than the usual onscreen buttons that a lot of newer phones have these days. The three buttons are, Back, Home and Settings. Having a Settings button is not something I’m used to having after being a Nexus user for so long, but if you long press the Home button, it’ll show recent apps. 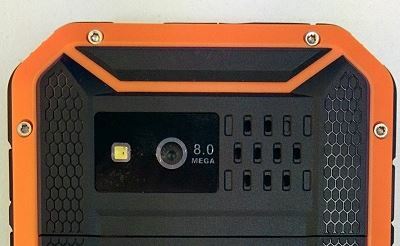 On the back of the phone, there is the 8MP Camera and the speaker at the top. 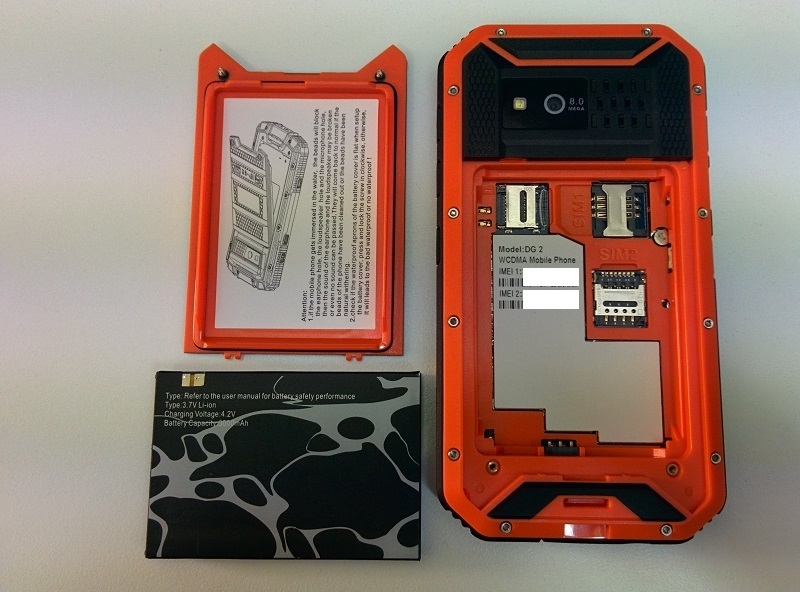 While at the bottom is the 2 screws that hold the backplate in place that helps make it truly IP68 compliant Removing these 2 screws and the backplate features the battery, both SIM Card slots and the MicroSD card slot. There are also two barcodes with both IMEI numbers on the back as well. The antenna jack is accessible via a screw in flap on the top of the phone and the MicroUSB and headphone jack are accessible via another screw in flap on the bottom. Unfortunately unscrewing the protective flap to access the MicroUSB port is a pain, but it’s necessary to provide adequate protection against dust and water. The DIGOOR DG2 Plus runs on Android 4.4.2 and as a Nexus fan, I was very happy to find that it’s running a near stock version of Android with a few minor changes. I checked for the Kitkat easter egg and found that it was there. I do know in the past that some rugged phones have claimed to have Android 4.4, but have actually had Android 4.2. Fortunately DIGOOR have not put any bloat on the phone and a virus scan revealed no viruses of any kind sideloaded on the system. Another perk is that Google Play with Google Services comes preloaded, so you don’t have to worry about sideloading or using a dodgy third party market place for apps. Overall I found Android to be very smooth on this device and I haven’t encountered any lag while swiping through the app drawer or homescreen which I’ve found to be an issue with some other Mediatek phones in this price range. The phone comes with your standard set of apps like all Android phones, but it also comes with a few extras that you won’t find on other phones. One of the interesting extras of this phone that’s found in settings is the ability to set the phone to automatically power off and power on. It can be configured to power on or off at a specific time and day(s) of the week. I personally don’t have a use for this, but a lot of people could probably use it alongside Tasker to improve automation. The phone also includes an app called Sensor Box that allows you to test the wide variety of sensors on the phone, such as the Accelerometer and Temperature sensor. I found the Orientation sensor to be quite accurate when placed on an uneven piece of wood, so it’s particularly useful if you’re building something and want to check if it’s stable. There is also an app called OOBE, or Out Of Box Experience. I’m fairly certain this app is something already included in Android when you first set the phone up, but it’s useful for people not familiar with Android as it shows you how to access the app drawer, notification bar, etc. The phone also includes NFC with an NFC reader app. This is useful if you’re using NFC tags and want to program them to do functions or if you want to use it to make payments using a service like Android Pay or similar. I’m not located in the US, so I can’t test out Android Pay, but my bank has an app that allows you to pay via NFC and it works flawlessly. The phone also includes an walkie talkie app to be used with the included antenna. After setting the correct frequency and using the dedicated button on the side of the phone I’ve been able to successfully communicate with other walkie talkies in range. I often have to use a walkie talkie to communicate while I’m working onsite and having the walkie talkie inbuilt saves me from having to have an extra device in my pocket. DIGOOR did a good job at implenting this and I wish more phone manufacturers would do the same. In the video below I submerged the phone in water while it was playing a video with sound. The video was able to keep on playing both the sound and picture while underwater and didn’t suffer any damage from it. The phone was also thrown onto the ground while playing a video and it survived with minimal damage. The screen was intact and the video kept on playing. 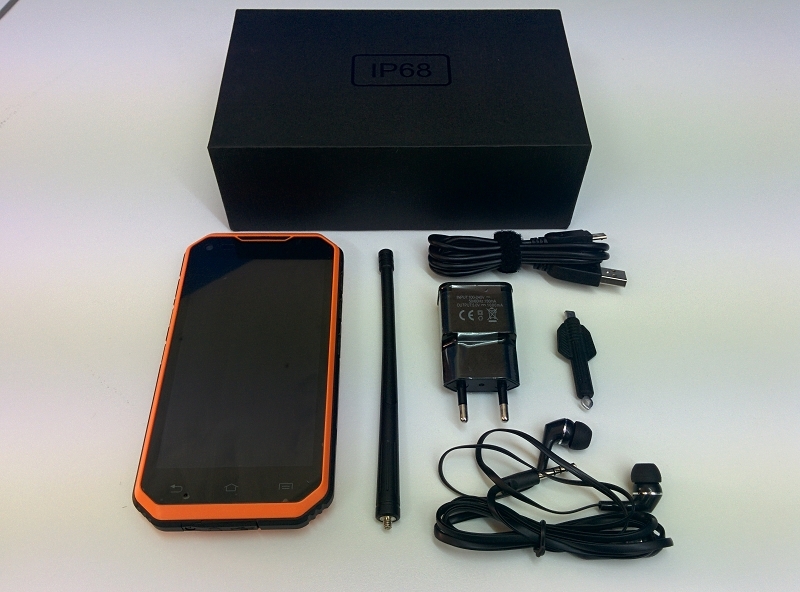 It’s fair to say that this phone is definitely IP68 as it claims to be. The DG2 Plus includes a 2MP front facing camera and an 8MP rear facing camera. 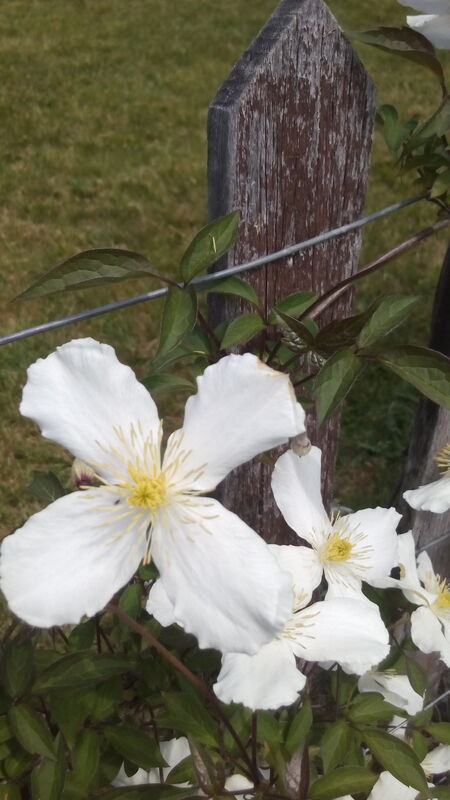 The cameras in this phone aren’t going to get any awards and are no where near as good as what you would find in a Samsung or Sony device, but they get the job done. The sample photos I took are good quality and the colours appear to have come out really well. Being able to use the camera underwater with the dedicated camera button on the side is a huge bonus as well. The only real downside I could find with the camera is HDR. The phone has to be held still otherwise it will be blurred. Part of this is my fault as my hands shake a lot, but having a stand or holding it securely in place will fix this. A different camera app would probably correct this as well. The phone has a single large speaker located on the back of the phone next to the camera on the top. This is an unusual spot as a lot of the phones will have the speaker on the bottom of the phone or next to the microUSB port. The quality of the speaker is decent and surprisingly the sound can be still heard clearly when the phone is submerged in water. The phone also has 4 predefined audio profiles, General, Silent, Meeting and Outdoor, It’s a great relief to find that it has a silent profile as that’s been removed in Lollipop. There is also an option called BesAudEnh that appears to enhance the Bass Audio when you’re listening to music with earphones. 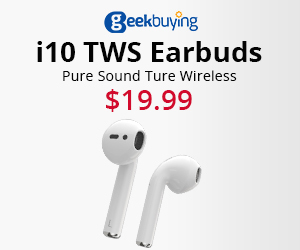 The included earphones with phone are decent, but you’d be much better off using some XiaoMi Pistons if you want higher quality audio. 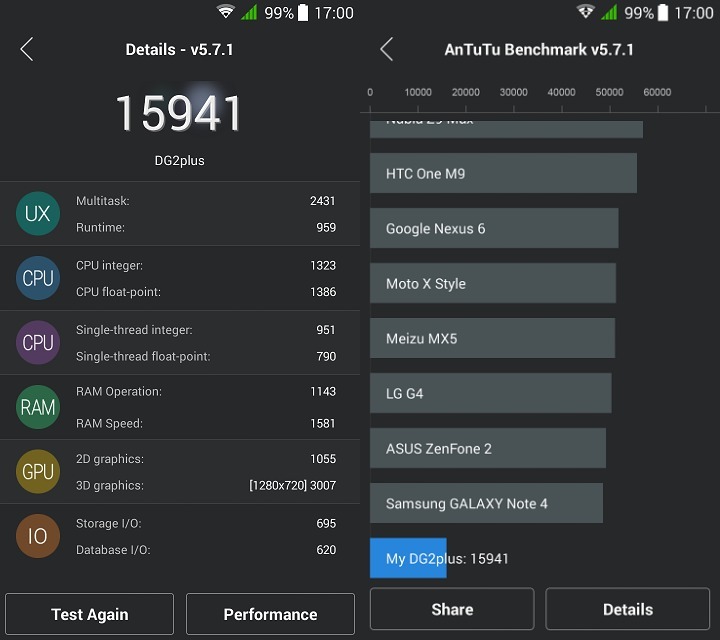 A benchmark test aith Antutu only gave a score of 15,941 compared with the much higher scores of the current flagships. This is to be expected as this phone is more catered towards being tough and unbreakable rather than being a powerhouse. While this phone is able to handle apps and most games fine, it will start to lag under pressure from a lot of graphic intensive games. That comes as no surprise since the phone only has 1GB of RAM and a Mali-400 GPU. The phone includes a 3000mAh battery that has managed to go a long way without needing a charge. While my aging Nexus 5 has been losing 30-70% of it’s battery in normal everyday use, the DG2 Plus has managed to only lose 10-40% charge in a single day of use. 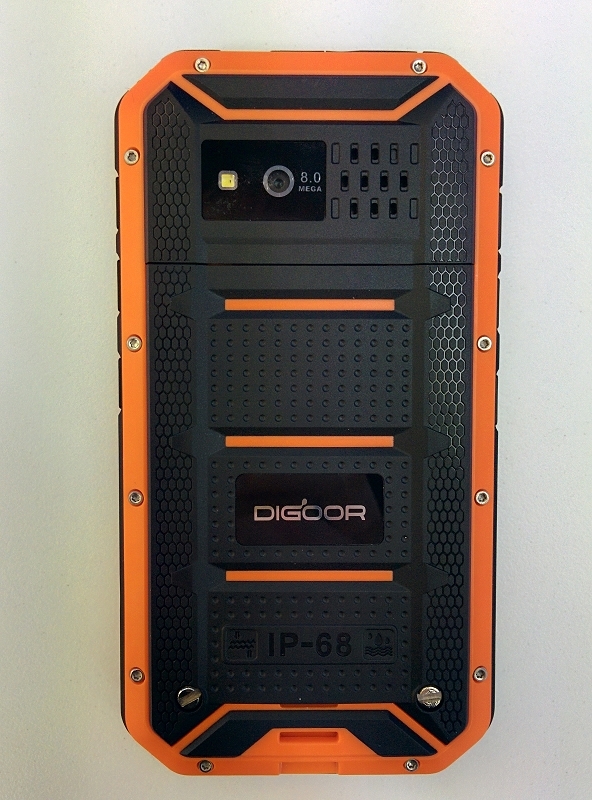 The DIGOOR DG2 Plus is a rugged phone with the IP68 rating that has waterproof, dustproof and shockproof properties while remaining cost effective with it’s $159.99 US price tag. It’s able to properly withstand submersion in water and repeated drops from height without breaking. The idea behind this phone is that it can be used in extreme situations and from my experience so far, it’s been able to do exactly that. Unfortunately the hardware inside isn’t the most powerful and there has been no OTA for Android Lollipop or Marshmallow yet, but it’s running Android Kitkat which is still quite common and does the job very well. Not having 4G connectivity with 8GB of internal storage is a downside, but it’s not a major issue as the phone is a massive bargain due to it’s low price. Rugged phones may still be a niché product for a lot of people, but with the tough design and special features such as the walkie talkie function, I can see these phones becoming much more popular in the future. The phone is definitely meeting my requirements and has survived some serious falls so far. If this was any other phone I’m sure it would have broken by now. I haven’t encountered any mobile network drop outs, Android hasn’t slowed down and the battery life has been good so far. So if you’re looking for a cheap rugged phone with an IP68 rating that does the job well and high end specs aren’t really a concern? Then this is the phone for you!